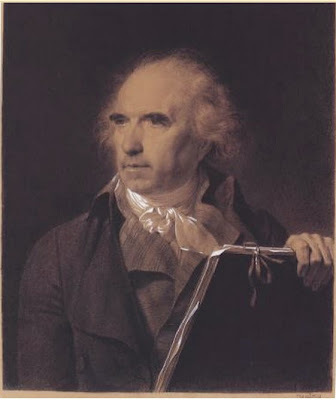 I love this drawing by Isabey of Hubert Robert in his sixties, with his fluffy hair and trademark bushy eyebrows. It seems to capture his resilient personality and energy. At least five different versions of the picture are documented and there is an engraving by Simon Charles Miger dating from 1799. This drawing, from the New York collection of Roberta J. M. Olson and Alexander B.V. Johnson, is possibly the original which belonged to Robert himself. (According to the inventory drawn up after his wife's death, Robert owned not only the painting but the Miger's copperplate and twenty impressions of his print). Isabey was a personal friend of Robert's. 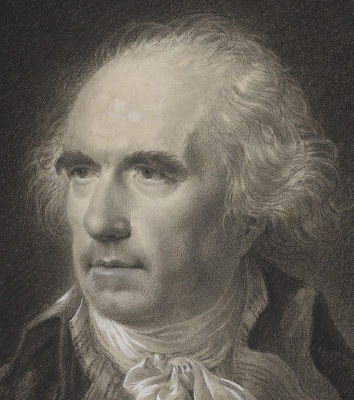 He recorded meeting him for the first time at Versailles in 1787: "From that time dates my intimacy with Robert, painter of landscape, man of talent and resources". He later worked under him at the château de Beauregard. In 1798 Isabey was granted lodgings at the Louvre and became Robert's neighbour, so the portrait presumably dates from about that time. 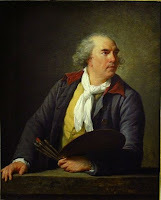 It may be compared with two earlier likenesses of a younger, more powerful-looking Robert exhibited at the Salon of 1789 - the portrait by Elisabeth Vigée Le Brun in the Louvre (left) and a sculpture by Pajou.